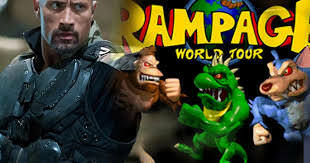 Dwayne "The Rock" Johnson's next film is based off of a video game, Rampage. While there have been a lot of movies based off of video games the curious thing about this one is the game goes all the way to the late 1980s arcade scene. Rampage was released in Arcades in 1986 and was something of a staple in arcades through the early 90s.In many ways Rampage seems like an odd game to base a film off of. I really can't imagine that many people remember it. That said the 80s and early 90s seem to be hot right now, with things like Stranger Things playing up the nostalgia factor. While the game was eventually ported on home system NES, Atari and Sega Master System I think most people who remember this game will remember it from arcades. I remember this game, I played the heck out of this thing. 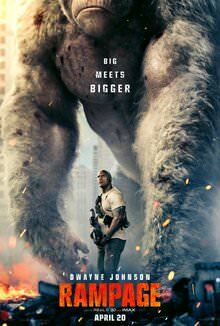 Rampage did very well in its opening weekend with a box office of $148.6 million allowing it to take the number 1 spot and beating out previous box office champ "A Quiet Place". Way back in the 80s and 90s there was an arcade in Aurora Colorado called Boardwalk USA. This was an awesome arcade that allowed you to play unlimited games after paying fixed fee. You could play arcade games all day. That place was basically my babysitter for many a saturday and I absolutely loved it. 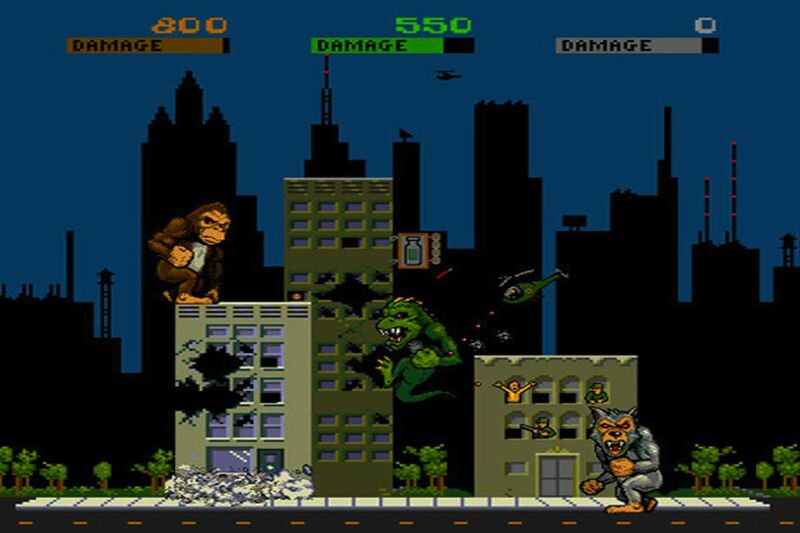 One of the games in the arcade that I was always entranced with was Rampage. In Rampage 3 different players could play one of 3 different giant monsters as you went through a city in a competition of mass destruction. The three different monsters were Ralph a giant werewolf, Lizzie a giant Lizard, and George a gigantic Gorilla. These monsters would battle each other and various puny humans who were trying to ruin their fun with tanks and such. There were different types of buildings, and different types of people. Once your character took a certain amount of damage your monster would turn into a little naked human. The other monsters could then pick you up and eat you. If they didn't eat you in time then you would revert back into a giant monster. Yes its a little nuts, what can I say this was the 90s. You would also get to travel to diffent cities with ever bigger towers and more advanced difficulty. The Monsters in the arcade game were all people who had come into contact with various bizarre items that had transformed into their giant monster state. George the Gorilla was transmuted by a experimental vitamins, Lizzie the giant Godzilla Lizard was transformed by a radioactive lake and Ralph the Wolfman had come into contact with an unussual like Food Additive. I played all of the characters but for what ever reason I always preferred Ralph. Werewolfs are my jam. The upcoming film looks like it will feature all three of the big galutes from the game. However, they will have different origins. Instead of being people transformed into giant monsters, these will be animals that will have come into contact something that made them Monster out. Will the movie be popular? Who the heck knows. If it is popular who knows it could start a whole new trend where old Arcade games get turned into films we will get Centipede, Astroid, Galaga maybe even some Dig Dug. Film conoseiers will no doubt decry their precious cinemas being befouled with yet another shallow pedestrian trend from Hollywood but I for one will be sitting in the front row with my popcorn and smile on my face.